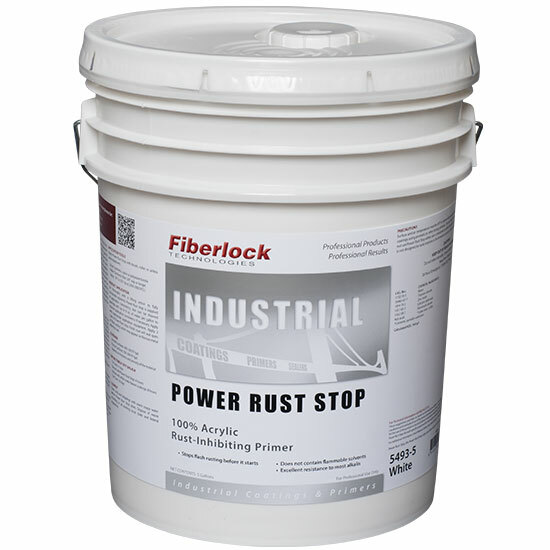 Use Power Rust Stop to inhibit rust on ferrous metal, galvanized metal, and other surfaces exposed to general industrial and atmospheric conditions. Power Rust Stop boasts excellent resistance to water, most alkalies, detergents and mild acids, and does not contain the flammable solvents found in other rust-inhibiting paints. Carefully clean up with a wet mop or HEPA vacuum. Remove all oil, grease, dirt, loose or scaling paint, rust, mil scale and other foreign matter. Industrial structures, tank exteriors, structural steel, etc., should be “commercial” blast cleaned (SSPC-SP6) or power tool cleaned (SSPC-SP3) as an alternative. Thinning: Material is supplied at application consistency but can be thinned sparingly with water if necessary to improve application characteristics. Power Rust Stop can be applied by roller, brush or airless spray. Store in a dry place at temperatures between 40°F (4.5°C) and 90°F (32°C). Surface and air temperature must be 50°F or above during application and drying time. Do not re-coat with coatings using aromatic or other strong solvents. Do not intermix with solvent base primers or finishes. Do not use Power Rust Stop when rain is imminent or when the dew point is above 60 percent. Power Rust Stop is not designed for tank interiors or for immersion service. When applying with a sprayer, wear a NIOSH approved respirator with any R, P, N or HE filter.